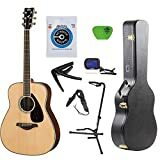 Unless someone is charging people $100.00 to watch them perform in an amphitheater, they are absolutely fine playing acoustic guitars under $200.00. In fact, most star performers could make a budget guitar sound like a Martin D-28 that costs five-grand. The mistake most beginners make is paying thousands of dollars for a high-end guitar, and then discovering their musical passion was just a passing fancy. 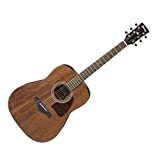 There are plenty of outstanding guitars available in a decent price range, and most beginners won’t be able to tell the difference in sound between budget acoustic guitars and high-end master crafted acoustic guitars. What a beginner should look at first is if the guitar is easy to play. Some guitars have a high action. This can be caused by a bowed neck or other factors that cause the strings to stretch higher above the fretboard than normal. This makes the strings harder to press down or bend, causing blisters on the fingers. If the action is too low it produces a buzz, and sometimes a tinny sound. Many people seek out and find acoustic guitars under $200.00, and they can last a lifetime. There is no reason for anyone to expect a subpar guitar just because they are on a budget. Some of the most common, and best woods for acoustic guitars are mahogany, maple, ash, and rosewood. Some guitars will list the wood body as being made from laminate or hardwood. These are nice words for plywood, and should be avoided. The style of machine heads, or tuning keys should also be taken into consideration. Cheap guitars will usually have one solid strip of metal with the tuning keys screwed into the strip. Decent guitars will sport individually screwed in tuning heads. Acoustic guitars have different styles. Some are smaller than the standard size, and there are also tenor guitars. Some people will mistake these specialty guitars as small acoustics, which they are. However, they’re called tenor guitars because of their high pitch. They are made to sound like a regular guitar that has a capo fastened high upon the neck. Tenor guitars are usually used more as an accompanying guitar, rather than an instrument for playing solo. Martin Guitars also developed the dreadnought acoustic. This guitar is built with a larger body than standard guitars and is known for having a deeper and more rich sound. It will be hard to find a Martin Dreadnought for under $200.00, but there are affordable knockoffs of this style. 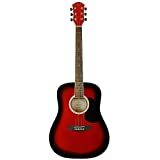 Below are some of the best acoustic guitars under $200.00. The prices shown are approximate. Ask most people what their first guitar was and they’ll probably tell you it was a Yamaha. There’s a good reason for this. Yamaha makes acoustic guitars of good quality and affordability. They can get banged around or dropped a few times and they hold together and keep their tune. This guitar is made with three woods: ash, rosewood, and mahogany. It’s considered a starter guitar and may have a blemish or two, and may feel cheap, or fragile. However the tone is great and it will stay in tune even if left in the case for some time. There is a reason Jasmine Guitars are big sellers despite not having big-name recognition. They are darn good guitars for the price. This is a spruce top guitar with sapele back and sides and a rosewood fingerboard and neck. Sapele is an African wood that is close to mahogany, but is less expensive. It is sometimes referred to as sapele mahogany. This guitar is abundantly playable, and while it is considered a beginner’s guitar, many intermediate players enjoy this acoustic. However, sometimes it may have factory errors that affect the playability, such as the frets being a bit too sharp, or something like that. If it can’t be tweaked at home, the company can always replace the guitar. When people think of Fender guitars, they picture an electric guitar, like the Stratocaster. However, Fender was making acoustic guitars long before the Strat came along in 1954. Not only does Fender still make high-quality acoustic guitars, they also make some that are quite affordable. People are often amazed to find a brand-new Fender for under $200.00. However, it’s true. A musician can easily make a Fender their first guitar. This guitar has a spruce top and rosewood fingerboard. The back and sides are basswood, which sacrifices a bit of tone for the lower price. The strings are close to the fingerboard, which is important for beginners, but sometimes will cause a bit of a buzzing sound. However, the proximity of the strings to the fingerboard is something that can be adjusted. This is a sharp-looking guitar with overall good tone and sound. Acultado is a brand without the high profile of a Fender or a Yamaha, but this is a beautiful guitar of fine quality for just under $200.00. It has a mahogany body and a spruce top. This acoustic has a richness of tone, and is extremely lightweight. It also features a cutaway to make it easier when playing notes higher up the fretboard. The fretboard, however, may be a bit too wide for some beginners. Spruce top and mahogany back and sides. This hybrid guitar has scalloped bracing. This means that the top is more flexible, giving the guitar a a much richer bass sound. Martin Guitars made this style popular in their guitars prior to WW2. This guitar, of course, also has a built-in pre-amp. The Donner has an amazing sound whether being played electrically or acoustically, it stays in tune, and records well on home equipment. The only downside is that it isn’t a Gibson, or even a Yamaha, but one would be hard-pressed to tell the difference. Speaking of Gibson, here is a chance to own a beautiful guitar with the trademark Gibson signature right on the maple neck. It has a laminated spruce top and kauri back and sides with a rosewood fingerboard. While it is a Gibson, it more accurately is made by Gibson Innovations, which is a division of Gibson guitars. Still, in many cases, a $62.00 Gibson is going to be better than many off-brand guitars of cheap make and quality. Kapok is a Chinese guitar maker that has been in business for over 62 years. The Chinese label may put off some people, but it shouldn’t. This guitar doesn’t quite have the deep tone of some of its American counterparts, however it is a joy to play. It is a fantastic guitar to string up with super lightweight gauge and thrash out some mean acoustic lead riffs. It is a fine-looking guitar with a laminated spruce top. Fully adjustable truss rod and Chrome Die Cast Tuners. One of the best values in a quality acoustic guitar. Oscar Schmidt guitars are at home in the hands of beginners or advanced players. They are known for having a rich, resonant sound and a sturdy build. This is a great guitar for banging out a loud, driving, acoustic rhythm. This particular model sports a spalted maple top. What that means is it has a unique finish that gives it a distinguished, yet wild sort of look. Spalting is a coloration that is caused by fungi. It is usually found in dead trees, but can sometimes occur in trees that are living, but are under duress. While this sort of colorization is prized among some woodworkers, the drawback is that the fungi can often weaken the wood. Ibanez is a Japanese guitar that defies description. These guitars enjoy fierce loyalty from those who play them and this model should evoke the same characteristic. Playing this guitar can almost give the musician a zen moment. It will sometimes feel as though it is playing itself and the guitarist is merely the vehicle. It gives one a different playing and musical experience each time, whether it is soothing or exhilarating. This model is all mahogany, except for the expected rosewood fingerboard, and the finish is sublime, just like the instrument. An open pore finish is achieved by laying an exquisitely thin layer of lacquer over the wood grains so that the natural and deep pores remain exposed, yet protected. Of all the acoustic guitars under $200.00 this could be the best one to buy. While there are many styles of acoustic guitars, one acoustic guitar that hasn’t been discussed yet is the nylon string guitar. These are usually referred to as classical guitars, and are used in classical pieces and flamenco. Their strings used to be made from catgut, or animal intestines. It wasn’t until post-WW2 that guitarists started using nylon strings instead of catgut. This was mostly due to the smoother texture of the nylon. Nylon string guitars have softer tones and wide necks. In fact, the necks are so much wider than regular acoustics that guitarists switching to nylon string guitars often require a period of adjustment. Here are some of the best nylon acoustic guitars under $200.00. The C40 is one of Yamaha’s most popular budget nylon string guitars. It has a spruce top, and Indonesian mahogany bottom and sides. The neck is nato, which is a sort of bargain mahogany usually used in beginners’ guitars. This guitar plays really well, but some of them will have an unnaturally high action near the top of the neck. This is usually about a $25.00 repair to fix, or the guitar can be replaced at no further cost. This guitar has a spruce top and agathis back and sides. Again, it’s super easy to play because it’s an Ibanez. This model has a really fast neck. This means basically the player will breeze through scales and arpeggios. Some musicians will balk at the mention of the agathis back and sides. Agathis is an evergreen wood that is a bit more soft than mahogany and less expensive. However there isn’t any loss of tone or sound with agathis. 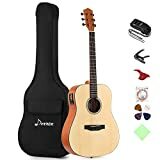 With this particular guitar it is suggested that the strings be replaced upon purchase with a new and known brand of strings. Although Cordoba has only been around since 1997, they enjoy a fantastic reputation among guitar players. Since they craft their classical guitars in Spain, they have an inherent knowledge of the nylon string guitar. This model has a spruce top with a light satin finish and mahogany back and sides. It is built with a truss rod in the neck for making adjustments. The ¾ size makes it even better for beginners. Some guitarists may find the string action to be a bit loose or lazy, but a beginner wouldn’t notice. It’s a fantastic starter guitar. 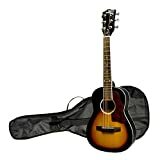 These are among the best acoustic guitars under $200.00, and are suitable for all skill levels. While beginners will use them to develop their skills, a seasoned pro choosing between buying a new guitar and paying the rent will be delighted with the options available. While inexpensive, these guitars are not cheap. If cared for, they will last for years. Warpage is the main enemy of acoustic guitars, so it’s important not to leave them out in the sun or stored in a damp place. A tip on buying an acoustic guitar in person is to hold the bottom of the guitar horizontally at eye level. Looking down along the neck of the guitar, one should be able to see if the neck is warped. By holding the guitar sideways at eye level and looking across the neck, one may see if the action climbs too high up on the fingerboard. The concert stages are filled with superstars who began by playing these guitars, and these professionals would be happy to snap one up again for a tune or two.